UNICEF Tap Project – Water Good Idea! I love this. I’ve donated water already. I encourage you guys to do the same. It’s easy, it’s free, it’s meaningful. And yes, it’s legit. 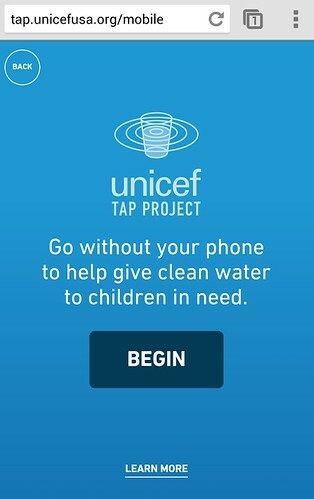 For every ten minutes you don’t touch your phone, UNICEF Tap Project donors and sponsors can fund one day of clean water for a child in need. This is subject to the pledged limits from the generous donors and sponsors. That’s it. 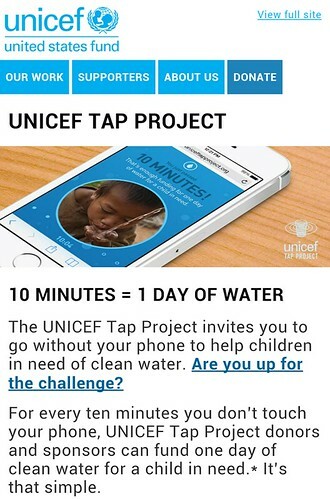 Go to uniceftapproject.org ON YOUR MOBILE DEVICE. You can start the challenge right away! 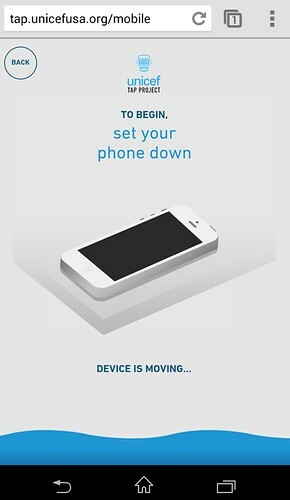 As I type this, I haven’t touched my phone for 5 minutes and 14 seconds. Five more minutes and I’ve donated a glass of clean water. No one can survive without water, and yet 768 million people around the world do not have safe, clean water to drink. 2.5 billion people don’t have access to a proper toilet. It isn’t just inconvenient – it’s lethal. Every day, 1,400 children die from diseases directly linked to unsafe water or a lack of basic sanitation facilities. I had my phone down this entire post. I just donated a glass of water. Go now and do it.